Hi Friends! Thanks for all your emails and messages about On The Menu! I’m glad you are enjoying it. Me too. It really helps to organize my week and grocery shopping! I’m trying to peruse the web and Pinterest to find new and scrumptious recipes each week. SCRUMPTIOUS! Today I’m sending out lots of love and prayers to my friend in the areas that got hit by Hurricane Harvey. Take care and God bless you! 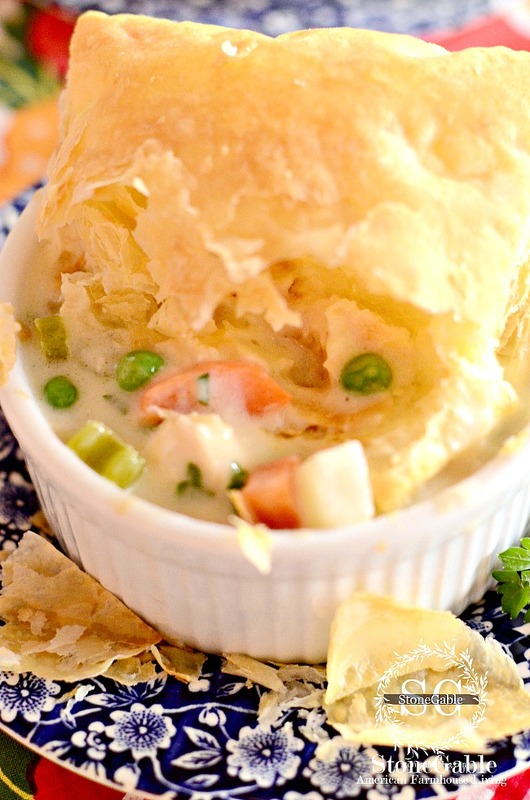 Cheater’s Chicken Pot Pie is one of my favorite things to make! It’s really easy and looks like you’ve been cooking all day! That’s why I called it Cheater’s! And the crust is puff pastry! What’s not to love about this dish? 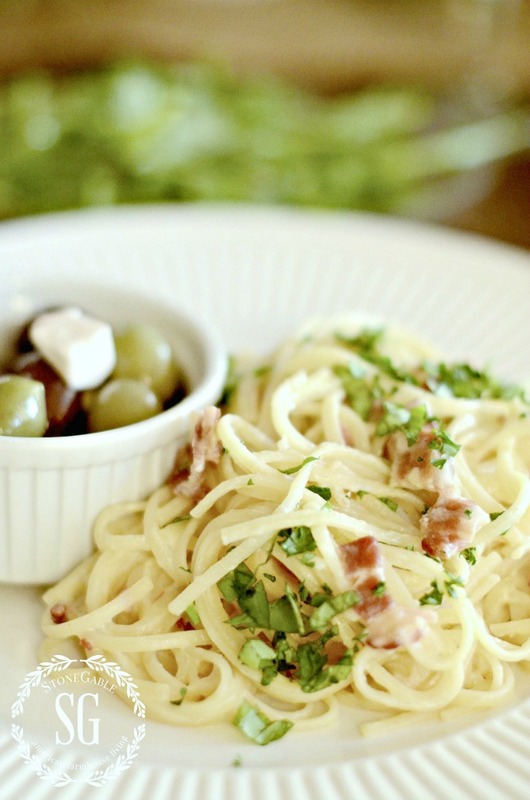 Pasta Carbonara is a meal you can make with what you have on hand. I always have bacon in the freezer. 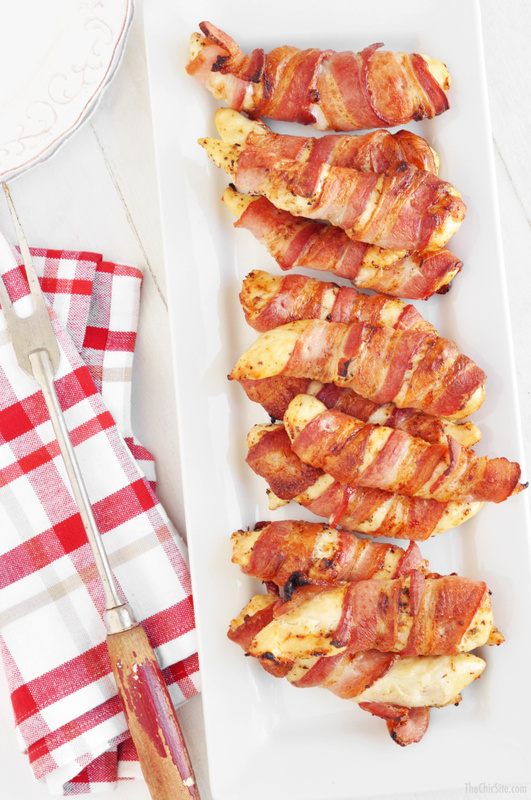 This meal is so so easy to make and everyone should have it in their recipe box! And the best part… it is absolutely delicious! Bobby and I have so many tomatoes in our garden so we are snatching some off the vine before they turn red for this amazing southern delight! If you have never tried to make Fried Green Tomatoes you really should. Oh, yum! One of my very favorite food blogs is CAFE DELITES by Karina! Her recipes are always easy to follow and so so delicious. And look at this beautiful shrimp scampi I am making! Oh, this will be amazing! The CHIC SITE is new to me. And I’m so excited to peruse Rachel’s foodie blog! If you have been reading On The Menu for any time you time you will know I LOVE Mexican food! And this recipe from SIX SISTER’S STUFF is in my wheelhouse. I grew up on tuna casseroles. But this recipe takes a noodle casserole to a new and exciting level! I can’t wait to try this recipe from AN ITALIAN IN MY KITCHEN. My zucchini will be put to good use! Aren’t these pears just glorious? And I bet they taste amazing too. 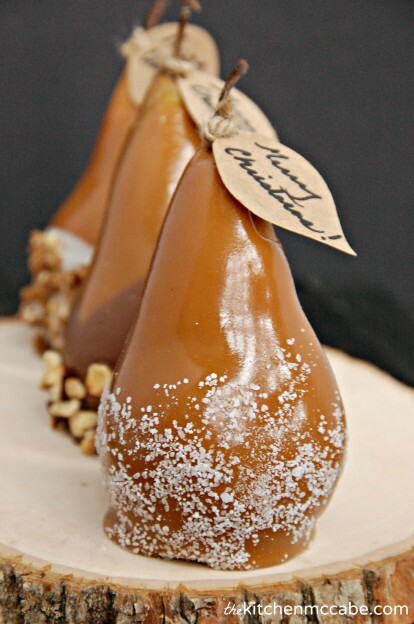 Pears are in peak season here at StoneGable so I can’t wait to make these from The Kitchen McCabe. 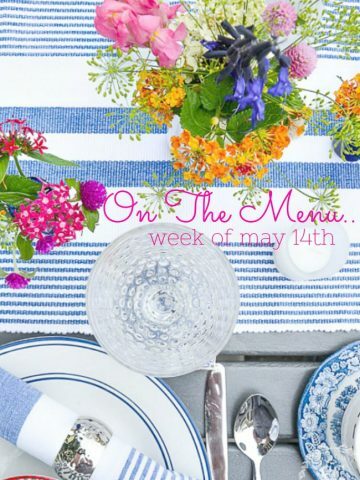 Here’s wishing you the most scrumptious week! Thanks for the recipes! 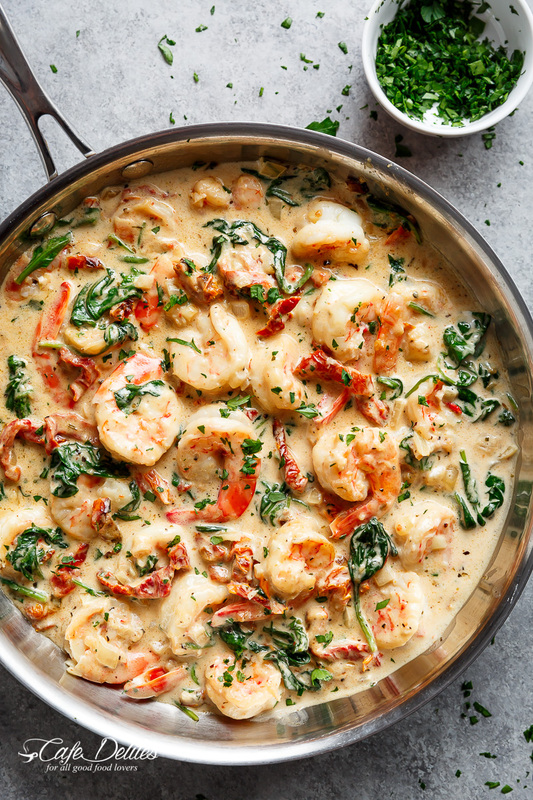 The shrimp dish looks amazing! 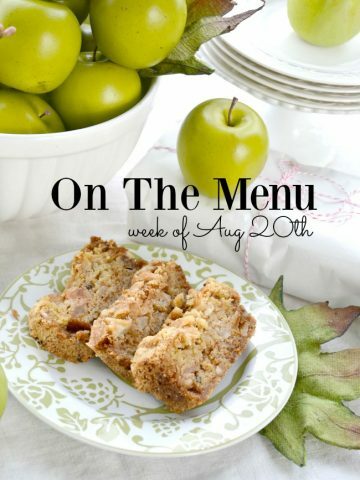 What a great lineup of recipes this week. I’m going to try the chicken pot pie, enchiladas, shrimp and the tuna bake. 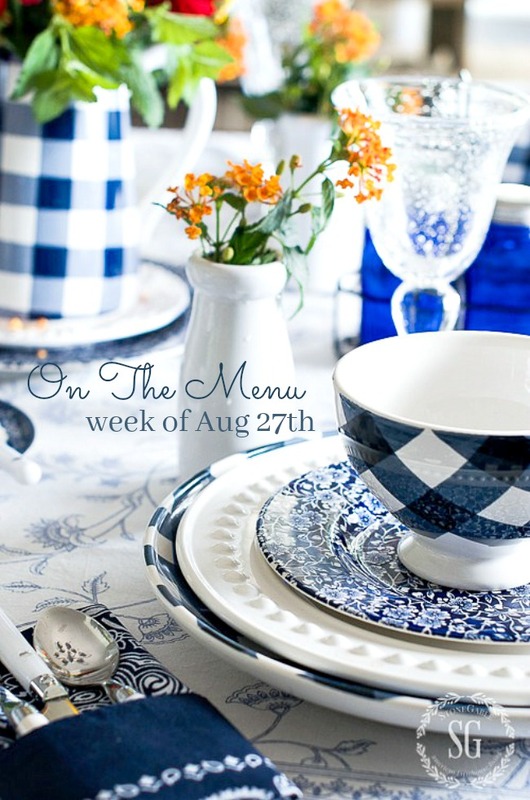 Thanks again for continuing your menu plans with your new blog design. They are so much easier to find now. I like looking back at past menus. They help my meal planning stay organized. ❤️? Love the chicken pot pie! Perfect for fall dinner with a pumpkin spiced coffee after! All the recipes look scrumptious! I love the photography on your blog, it is beautifully done. Everything looks soooo yummy.Thanks for the recipes. Your recipes always look so delicious and taste even better. Love that you put the menus together such a help. Love you Blog. We’re definately having some of these this week!!!! Thanks again for reviving this type of post, we ❤️❤️❤️❤️ALL your recipes! 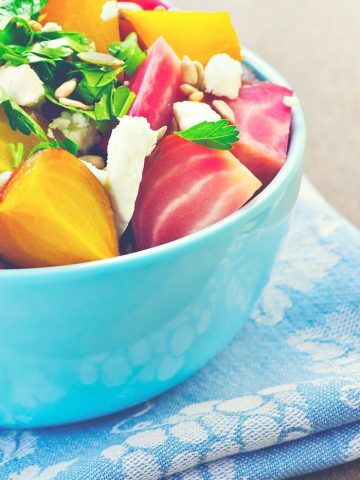 Thank you so much for these helpful healthy weekly meals ideas. You have no idea how much I appreciate them, as well as how much it takes the stress of trying to think of, ‘what’s for dinner’ each day. Wonderful menu and every single one looks delicious. 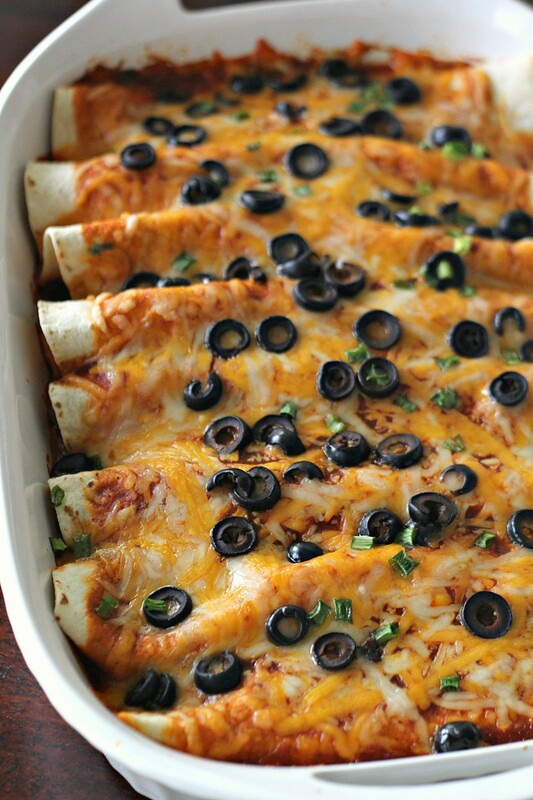 We love anything Mexican and enchiladas are one of our favorites with guacamole, chips, salsa, queso and a margarita, frozen of course. Love that tuna recipe and can’t wait to make that and the chicken tenders! I’ve made your Cheater’s Chicken Pot Pie several times and it’s so good and a favorite around here. On a side note thank you for your thoughts on prayers for my neighbors here in Texas. Fortunately, we are outside the worse part of the storm so will just have some rain starting today and going through next weekend it’s looking like. Please continue to pray; my southern neighbors need them. Pinky, you are a classic!!!!! Happy belated birthday my friend! Wow! What a menu! It all sounds delicious especially the Tuscan shrimp! Yum! Thanks for sharing a wonderful variety for the week ! We are going to be eating good this week thanks to you, Yvonne. Everything sounds delicious. Can not wait to try everything. Enjoy your weekend. Thanks for sharing!! Theses recipes look delicious, especially the chicken pot pie and the shrimp scampi. I will definitely try these. Im new to your website and I’m obsessed! Hi Ambre, Welcome to the StoneGable family! 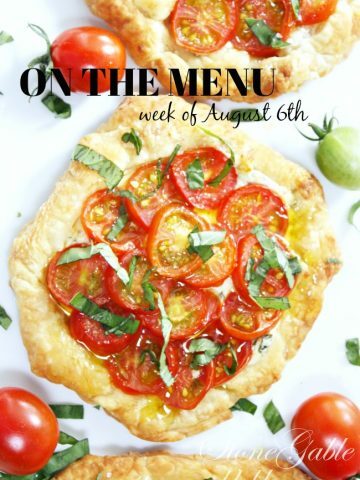 Your menu looks amazing this week. So many recipes I am going to try. Plus you had me with the blue checkers. Beautiful place setting. Thanks Yvonne. Is Stone Gable the name of your business,or just the name of your home? Both! My home is named StoneGable and my businesses are named after it! Your weekly menus have really inspired me to do more meal planning. I love your photos and each recipe looks delicious!!! 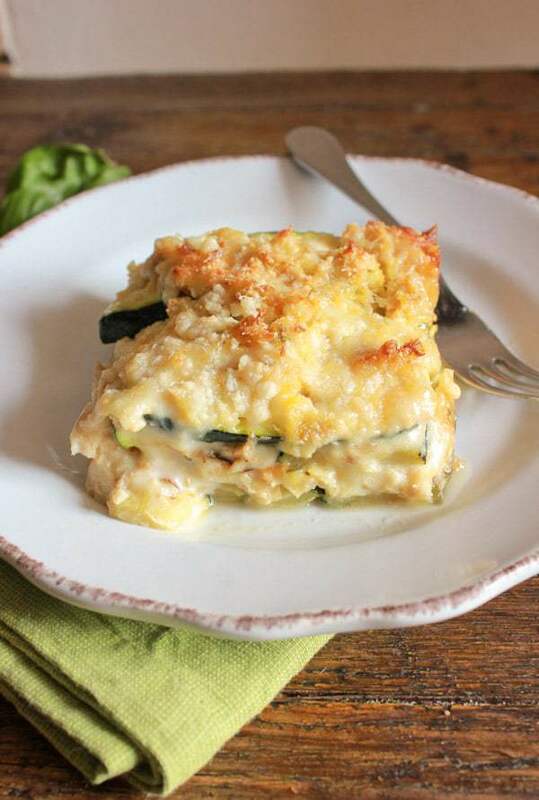 I immediately plan to try the zucchini/tuna casserole….yum. Your menus are so delicious sounding!! Can’t wait to make the Pot Pie/total comfort food and the Tuscan Style Shrimp. 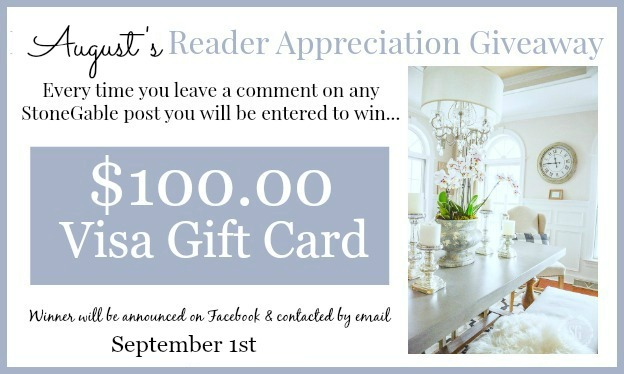 New to your site and love it. Hi Linda! I’m so happy you found us! Welcome to the StoneGable family!